Cal-Mil 1608-55 Squared Stainless Steel Three Cylinder Display - 16" x 5 1/4" x 6"
Hi, and welcome to the Cal-Mil classroom. Here at Cal-Mil, we have what we like to call collections. These collections consist of a series of product with similar design and material that offer a wide range of uses, which I’ll walk you through today. Today, we have the squared collection. Available in black metal or stainless steel, this collection is designed with a bold and modern edge. Its state of the art metal work with geometrical cut outs makes the squared collection unlike any other. As you can see, these are add-ins that you would use for a full buffet set up, large or small, ranging from beverage dispensers, chafers, condiment organization, risers, and more. To see the entire collection, as well as 12 other collections, visit us online at cal-mil.com, where you can also request a 2015 catalog today. Thanks for stopping by and I’ll see you next time in the Cal-Mil classroom. Looking for a bold and modern set up for your buffet? Try Cal-Mil’s squared collection! Featuring state-of-the-art metal work with geometrical cut outs, you’ll impress your guests every time! 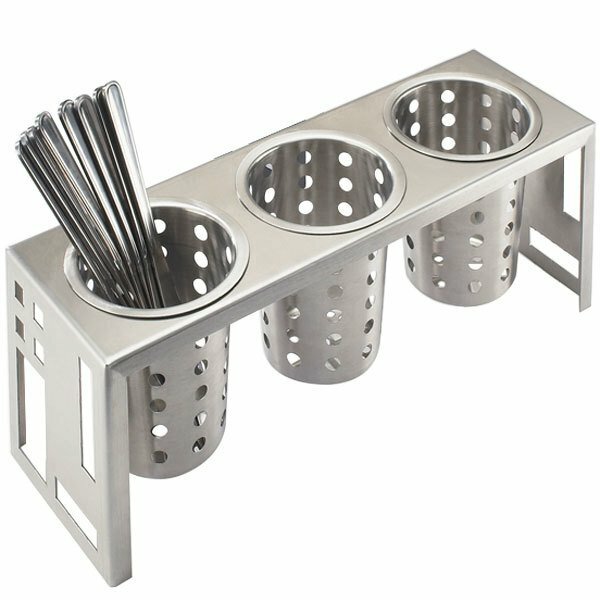 This Cal-Mil 1608-55 squared 3 cylinder stainless steel display is perfect for holding your Cal-Mil flatware cylinders (sold separately) for the ultimate utensil display! Mix and match between perforated cylinders or brightly colored melamine cylinders to complement the decor of your venue! Featuring a horizontal design, this display makes it easy for guests to see contents. Great for restaurants, cafeterias, hotels, or buffets, your guests will appreciate the accessibility of forks, knives, and spoons. You can even store condiments and supplies! From ketchup and mustard packets to sugar packets and straws, you can get creative! This holder is made out of stainless steel for long-lasting durability.